Questions for the author ~ we've reached the end of the month! I did finish the book earlier this week. I wish I had had more time this month to post about it, but I will do a post by the weekend about some of my final thoughts. I'll send this to Masha Hamilton later today, waiting for the possibility that somebuddy will have more questions to add. Please, please, please? For the record, Masha joined my face-to-face book club last night via speakerphone ... and I know the answer to the cartwheels question! However, I think I'll let you hear it in her own words. 15. What do you think of this quote from Part Three? "Fi had never accepted Mr. Abasi's claim that Mididima and settlements like it could disappear with a still breeze -- that the next time the Camel Bookmobile came, there might be no sign that life had ever huddled there. She'd considered this assertion nothing more than another attempt to talk her out of making the trip he hated. It seemed to her, in fact, that the houses of Mididima were rooted directly in the earth's subsurface, and that during the coming generations the settlement could only spread" (p. 127). 16. What did you think of Fi journeying to Mididima alone? 17. Why do you think Jwahir was attracted to Abayomi, instead of her husband Matani? 18. What do you think of Taban's desire to make pictures "pop off the page" (p. 146)? 20. Did you notice the mention of female circumcision (p. 150)? What do you think of it? 21. Jwahir's father said, "Matani, like his father before him, is too fond of a remote and dangerous world." Why do you suppose people think any place (or anything) far from what they are used to is dangerous? 22. Neema had a problem with the white woman in the village. Maybe I should say problems, plural: Besides the fact that this woman was a foreigner, she had her own peculiar noises and smells and, worst of all, was sleeping between Neema and her granddaughter (p. 168). Neema couldn't imagine the foreigner's city which was said to have cars that moved with the speed of a gazelle, but she overheard Kanika saying, "I want to go to the Distant City" (p. 169). Can you relate to Neema's feelings? The acclaimed author of Into the Forest mines our fears and explores our capacity to love in this epic tale of modern motherhood. Young and pregnant, Cerise and Anna make very different decisions about how to direct their lives. While teenaged Cerise struggles to support herself and her young daughter, Anna finishes college, marries, and later gives birth to two daughters of her own. After the birth of her second child, a tragic accident tears Cerise's life apart, and she loses her already tenuous position in society. 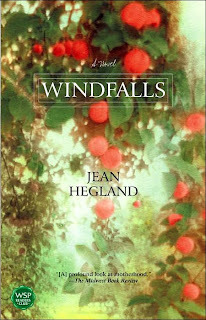 As the story progresses -- and Cerise's and Anna's lives interweave and inexorably approach each other -- both women are dramatically, forever changed. Her book Into the Forest made a huge impression on me when I read it years ago, and I still highly recommend it to people. If this one is as well done as that, we should be in for a great discussion. Yay! I finally have the book! I've just finished reading Part 1, and here are my thoughts. I haven't read any other discussions yet, so I hope my answers won't be too repetitive. Since I'm jumping in late, I'm not sure what questions have been asked already or if it's too late. I'll have to check. 2. Fiona Sweeney had found that "the assumptions people made about one another were invariably wrong" (p. 11). If you struggle (as Shirley is struggling) with whether Westerners should disrupt the lives of people like those in Mididimi, ask yourself about Fiona's assumptions, and also about the assumptions made by some of the Kenyans: Mr. Abasi the librarian, the elders who believe it is "far better to learn to read animal scents on the breeze or the coming weather in the clouds" (p. 15), Neema's brother-in-law Elim who believes that "the hours you waste staring at pages ... is a rotten sin" (p. 33). Then compare their assumptions with what the teacher Matani thinks: "How the Camel Bookmobile offered the only chance of survival for this collection of half-nomads with only one toehold in the future" (p. 39). At this point I do feel like Fiona is overly idealistic (and I can be the same way, so I'm not trying to be too critical), and assuming that she will only be introducing positive change, and that she will make a big difference in their lives through books, and that without her and the bookmobile, their future will be in danger. I'm sure she will do good and make a difference, but it may undermine some of the beautiful and peaceful aspects of their life along with it. Mr. Abasi also makes false assumptions about Fiona and westerners. His view of her is shaped by the television shows he has seen, and he pictures her someday returning to her gowns and love affairs. How easy it is for us to tidily put everyone into some stereotypical group. It takes effort to remember that not everyone fits in to some category. 3. Jwahir, the teacher's wife, thinks the books are "for the foolish or misguided of Mididima" (p. 48), but even she found something good about Library Day. What was it? Do you agree with her assumption that it's a good thing? Without the bookmobile's arrival, Jwahir would have not begun her closer relationship with Abayomi. To me, the coming of the books and bringing new ideas and feelings to the people is very similar to the new relationship of these two, bringing new emotions that Zwahir that she has never felt before. Which of these situations has more potential to be disruptive to this community? 4. "Mididima ... means Those Rooted in Dust" (p. 25). How is this a metaphor for the lives of the villagers? In what ways are their lives changing, for the better or for the worse? Being "rooted" makes me think of entrenched in their ways and not easily changed or taken away. "Dust" makes me think of primitive beginnings, I guess like in Genesis--from dust Adam came. I think their lives will change in both ways. There are two sides to every coin. I think in their case it may be a question of survival more than good or bad. 5. Mr. Abasi considered Miss Sweeney meddlesome: "These foreigners couldn't understand that literacy was not the only path to education. In tribal settlements, the tradition was an oral one..." (p. 51). What do you think about a librarian with this attitude? Well, Mr. Abasi is quite a character! He seems a bit lazy and a little cowardly. It's hard for me to tell if this is how he really feels, or if that's just his excuse. Either way, I do see his point. Foreigners do need to recognize the wisdom in other ways of living and learning. It's hard to not think of interference as arrogance. It should be viewed as more of a mutual sharing, rather than one giving to another. 6. What do you think about Mr. Abasi's rule that losing even a single book means the camel bookmobile will not return to the village? What was Mr. Abasi's ulterior motive for making such a rule? All I can say is that I would be in big trouble! I rarely lose books, but I do provide my library some financial support with my overdue fines! Mr. Abasi is just looking for an excuse to not have to go to Mididima, and he thinks money for the bookmobile would be better used buying more for the standing library in Garissa. 7. Why do you think educated people are feared by the illiterate? "Mothers watched with a mixture of envy and resentment as she [Kanika] shared some mysterious secret with their offspring. They didn't respect her any more than ever. But they were afraid of her ... afraid of the skill she possessed that they didn't have" (p. 16). This is something I haven't really experienced in life or ever really thought about (Which is of course one purpose for reading, isn't it? For these people in Mididima, being very superstitious, I can see it as seeming like something supernatural to be able to able to look at markings in a book and come out with completely foreign images, stories, ideas (like recipes!). They can see it as a power, but are wondering if it is good or evil. 13. "He would have emerged a different man if he'd been born someone else's son. A hunter. A warrior, perhaps. It wasn't predestined, his current life as Mididima's teacher" (p. 115). Have you ever wondered who you might have been, if you had been born to someone else? This reminds me of something that I believe was said by Malcolm Forbes when asked for his secret to financial success. His secret was, "Choose your womb very, very carefully." I've never given any serious thought to what my life would have been life if I had been born to someone else. 14. When Abayomi brought his mangled child to Matani's father, Matani had bolted, "cowering like a child" (p. 129). How did this affect his life? Matani's running from rather than confronting something bad continued throughout his life making it difficult for him to confront reality. Hi, go to this link, www.moleskineire.com Scroll down to The Red Leather Diary. It's a video promo of this book. Oh, BTW, scroll down further, CHOCOLATE PENCILS!!! Enjoy. I see you met THE LIBRARIAN Nancy Pearl too. What fun! Did you buy an action figure of Nancy? the wonderful wizard of words." Okay, maybe I got the song a bit mixed up. Maybe it should be "We're off to see the author, the wonderful author of The Camel Bookmobile." Nope, that doesn't scan. But you get the idea, don't you? When Masha Hamilton said, "I’m off to Tennessee," I emailed her to ask where in Tennessee because I'm in Chattanooga, on the bottom edge of the state. Kingsport is worse than Nashville or Knoxville, which are closer, but better than Memphis, which is about twice as far from me. The wheels started turning (yes, I know it's a cliche), and I googled and schemed, trying to find a way to get there to say hello. A convention for librarians, huh? I'm not a librarian, and there was no way I had time for several days at a conference. When was Masha on the program? Aha, Wednesday! And for the whole afternoon. Oh, joy! My friend Donna managed to get that day off, so we set out on our journey early on Wednesday morning. "Will we be allowed in?" Donna asked. "Don't know," I said with a shrug. "We're driving three-and-a-half hours each way, and you don't know whether we can even get in?" Donna was incredulous. "What if we can't get in?" "Then we'll wait until it's over and follow her to supper or something," I said. Donna has known me for years, so she is well aware of my proclivity for doing things in my own inimitable way. She shook her head at my readiness to trust audacity to get me where I'm trying to go, but nevertheless we were off on our adventure. She read The Camel Bookmobile while I drove up the eastern side of Tennessee, going just over the speed limit, but not so fast that I attracted the attention of the radar guns. I stayed at the Meadowview Conference Center several years ago, so I had an idea of what to expect, but I think they've added on since I was there. Having done my homework, I had a print copy of the layout of the place and knew Masha would be in Salon One from 1:30 to 5:00 pm. So when we arrived a couple of hours early, I approached the first official-looking fellow and asked how to find that meeting room. "Down that hallway, then turn right and it's at the end," he said. "And where's the nearest restaurant?" I asked, having observed streams of people exiting the buildings as we drove into the parking lot. "We have one right here in the Convention Center," he said. "Turn left at the end of the hall, instead of right." We went the way his finger had pointed and turned left. As we approached, the maître d' said, "Two?" "May I go in and look around," I asked, "to see if I can find the person we're looking for?" Given permission, we went inside. I was scanning left and right, table to table, when a woman crossed my path toward the dessert bar. "There she is," I told Donna, as I moved rapidly toward the woman wearing bold colors, unlike most of the librarians in the room. This beautiful peacock MUST be the wizard herself. She turned to me with a smile and said, "Yes?" We did it! I had managed to meet her after all. Yessss! 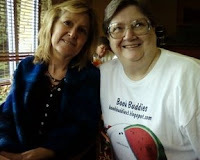 I could tell by the look on her face that she wasn't quite sure if she knew me, but I pointed to the Book Buddies tee-shirt I had worn while saying, "I'm Bonnie Jacobs of Book Buddies, online." When Masha realized who I was, she reached out and gave me a hug. I asked if she was eating with anyone and sort of invited myself to join her, if that was okay. Before we went to her table, I informed the maître d' we would be eating, after all. We didn't bother getting food before joining Masha and Gail Campbell, Adult Services Librarian at the Johnson City Public Library, the one who had the enviable job of ushering Masha around during her visit. Since we wouldn't be there the following day for the book signing, I asked Masha to sign my copy while we were getting acquainted (read Marsha' inscription here). Gail asked me to take a photo of her with Masha, then Donna used my cell phone to photograph Masha and me (that's it at the top of this post). When the two of them left to set up the room for Masha's presentation, Donna and I had lunch from the soup-salad-dessert bar. It was afterwards that my chutzpah kicked in big time. 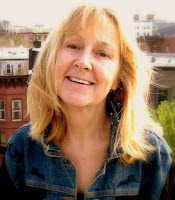 And now a word from our sponsor (well, she isn't exactly a sponsor, but I want to tell you about this): Masha Hamilton teaches a couple of ten-week online novel-writing classes. During an afternoon break, she told me about the work involved and ... guess what? ... I think I'm going to do it! I need to find out the dates for Novel I and Novel II, but I think I can, I think I can, I think I can. And now back to our regularly scheduled blog post. Here's some of what I learned during the afternoon sessions. First, I found out Masha is an excellent speaker. Is "rapt attention of the audience" too much of a cliche? She's a real storyteller who kept our full attention. Easy laughter followed her account of telling her 12-year-old about when she was a girl, writing book reviews for herself, sometimes adding pictures, even though it wasn't homework. Her son said quietly, "Mom, I hate to tell you this, but you are a nerd." I think we book people could relate, being somewhat nerdy ourselves. Masha's very glad she waited until the book was finished before visiting Africa. One reason is that Mr. Farah, the real librarian, is so much like Mr. Abasi, the fictional librarian. "It's funny that you are so much like the librarian in the book," she said to Mr. Farah. "Don't you think that's strange?" "Strange, yes," he said solemnly. "Funny, no." The librarians showed their appreciation of that tale by laughing and clapping. The story does indeed show us just how much the real librarian is like Mr. Abasi. I think Masha is dead on with her depictions of the people. I can see them, hear them, sometimes even smell them as they move through their story. Masha took her then-17-year-old to Africa on that final research trip. Her daughter begged to go and was so persistent that Masha finally allowed it, with the stipulation that she could never be out of her mother's sight "except to use the bathroom." I can understand that; I'd have a hard time myself taking a teenage girl into an area rife with violence. But what an opportunity for her daughter. When they walked into the bush with the camels, Masha and Briana distributed maize and cooking oil to women, who valued the food stuffs more than the books. 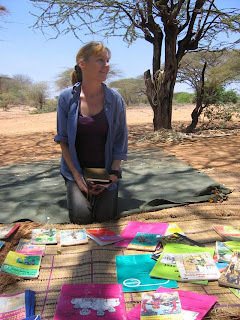 Masha's book is fiction, but there really is a camel bookmobile in Kenya. During her presentation, Masha showed us this two-and-a-half minute video of the real thing. Notice how intent the people are, once they have books in their hands. It certainly doesn't look like YOUR library, does it? The anticipation among patrons in your town may not be as palpable, either. As Masha said, "You can see how absorbed the kids are." Reading is a generational thing: women over 40 don't pick up the books. Also, the older generation fears loss and encroachment of the outside world. Reading the books, even if they don't relate directly to the lives of the tribal people, opens the readers to the fact that not everybody is pastoral. Not everyone tends goats. Houses are built to be taken apart. The tribes move two or three times a year, so they aren't settled in any one spot. As people settle, they will read books more than they do now. The theme of The Camel Bookmobile is the whole American overseas experience. We really want to help, but we do it with limited knowledge of the people and the situation. What kinds of books should we send to Kenya? Children's books, first, and then books on childcare. No religious books, please! There's a wish list on Amazon and Powell's, if you want to see specifically what they want and need. Ah, one of you noticed that I never got back to what I said before the commercial break above: "It was afterwards that my chutzpah kicked in big time." Okay, I'll confess. You do recall that Donna and I, in effect, crashed the party ... uh, the conference? It was actually a pre-conference event with the author, but you know what I mean. Gail Campbell, who was having lunch with Masha when we arrived, led the group in what we could call book discussion designing. She divided us into smaller groups to come up with questions that might work with a book club. When she brought us back together, we shared the best of our questions, which she wrote on a flipchart. And then came the praxis, which basically means it's time to practice and see if this will really work. Using the questions we had come up with ourselves, we would have our very own book discussion right then and there, with the book's author ready and willing to provide feedback and answer our questions. "Who would like to lead the discussion?" Gail asked. There were no takers. One librarian said she would do it, but she hadn't read the book. I hesitated, though admittedly only a very short time, because I wasn't even supposed to be there, for Pete's sake! But there's that chutzpah, and I volunteered. I don't know if it was the right thing to do or not, but I had lots of fun. Did you notice the tee-shirt I was wearing? If you can't read the words, click on the photo at the top to enlarge it, and see that it is not exactly an off-the-rack shirt. The librarians closest to me asked about Book Buddies and ... you know me ... I'm not bashful. So I handed out my "business" cards. (I'm retired, except for reading and writing and blogging and occasional teaching and leading book discussions ... and I don't sound very retired at all, do I?) On my cards I have not only the usual information about myself, but URLs to the Bonnie's Books blog and this one. I hope you know I'm proud of the group we have here. Where else would you find people who are willing to play along with the idea of partying on a cyber-island with book characters? Here are some of the questions used for the One Book, One Conference discussion in Kingsport. They are good questions. which I'll probably ask you later in the month. What book would you send to the Camel Bookmobile, and why would you pick that one? Were you surprised by the book's ending? What do you think happened to Fi when she returned home? What do you think happened to Matani and the others? What did that strict library fine mean to the people involved? How did this book change your life or your attitude? I would have loved to stay to hear what Nancy Pearl had to say on Thursday. You do know who she is, don't you? She's so famous there's a Librarian action figure of her. No, really! Donna bought the blue action figure when it first came out; it's holding a teensy-tiny copy of Nancy Pearl's Book Lust. Many thanks to Masha who sent me this photo, taken yesterday, showing (left to right) Nancy Pearl, Nancy Renfro (a librarian I didn't get to meet at the convention), and Masha herself. Can you tell what they are doing? 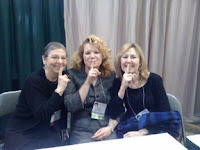 They are "doing that librarian shushing thing," Masha wrote. Thanks, Masha! Now, if "they" would only put out an action figure of Masha. Any doll that represents Masha would have to be one that could travel to Afghanistan and Israel and Russia and Kenya. That means it would have to be much more active than Nancy Pearl's ... and I'm absolutely certain it wouldn't be shushing anyone! One last note ... the convention handout package included two articles about Masha and The Camel Bookmobile, one from the March 2008 issue of Family Circle (p. 76), and the other from the December 2007 issue of Oprah's O Magazine (p. 274). If you don't have those magazines, maybe your library does. It's Friday and I need more questions for Masha to answer over the weekend. Where are you? Nobuddy has posted anything about the questions for Part Two. I know you must have read it by now because today I'm supposed to post questions for Part Three. I've gotten as far as finding the photo of Masha and me on my (new) cell phone, but it seems I must now set up an account called My Albums in order to get it online. Maybe by the time I finish writing my (long) account of my Wednesday adventures in getting to meet her, I'll be able to post our photo here. Keep your fingers crossed. "I’m off to Tennessee," she said. Hey, I'm in Tennessee, but she was going to Kingsport, about a three-hour drive north of Chattanooga if I push it a bit. So .... guess who I met today? Guess who wrote this inside my book? A delight to meet you! Is this fantastic, or what? I'd write more, but I'm tired. I'll tell you all about it tomorrow. Some of the women I met at the conference had already dropped by to visit this blog by the time I got home tonight. Yep, I told them what a great bunch of folks you book buddies are, so we may have a few visitors ... and maybe some will join us. Oh, did I forget to tell you these people are librarians? Masha addressed the Tennessee Library Association's convention because they had chosen The Camel Bookmobile for their first ever One Book, One Conference. I am so revved up that I have already put Masha's second novel on hold at my library tonight. The publisher chose the title The Distance Between Us for that one, though Masha wanted to call it Lust of the Eyes. Have you read it? 8. More questions for the author, please, before Friday. 9. Who is the Hundred-Legged-One? 10. What's Scar Boy's real name, and why is it so important to him? 11. What is Mr. Abasi's point in telling Fiona this story? "Let me tell you a story," Mr. Abasi said, sitting again, "about another settlement not too far from Mididima. The people there fetched water from a well that was a four-hour walk away. A few years ago, a Christian mission raised money and started to build a well that would be only fifteen minutes away. Before they could finish, it was destroyed. They began to build again, and again it was destroyed. Finally, they asked the people of the settlement if enemy tribes were wrecking the well. No, the people said. They were destroying it themselves. The women had always walked those four hours, once a week, and it didn't seem too long to them. It allowed them a break from daily chores and a chance to visit their neighbors. Also, it had become a rite of passage from girlhood to womanhood, a part of their culture. They didn't want a well fifteen minutes away." He rubbed the back of his neck. "These people have connections to the land and their traditions that outsiders might not understand" (p. 113). 12. Mr. Abasi said, "Have you heard ... that many of our people believe if you know five colloquial expressions in their tribal language, they must always provide you with nourishment and shelter? ... But if you know fewer than five, they owe you not even a sip of water" (p. 114). How would you explain what this story means? The villagers' roots are also without stability because they are forced to move to survive. Their lives are now being uprooted not only because what appears to be a coming draught, but because of the educational opportunities (the camel bookmobile is a big part of this opportunity)which will result in more of the people leaving their community. Although not as dramatic as the Mididima villagers, we are all "rooted in dust"--ashes to ashes, dust to dust. Even with whatever religious beliefs we have giving us immortality, our earthly lives are limited. However, through books and other written documents, people can have limited immortality with their earthly lives. I think that Abasi realizes that the oral tradition is not being appreciated by those such as Sweeney who bring book learning to villages without fully appreciating oral tradition. He seems to realize that changes are coming to the village and is afraid that the oral traditions will be lost as part of this change. It is interesting that libraries are adopting broader approaches to include not just written materials, but also art, movies, and music as part of their collection. I don't like the rule that one book lost results in the whole village mosing bookmobile visits. However, the rule does emphasize the value of books to the people and the books are in scarce supply. Perhaps Abasi doesn't think that villages will be able to comply with the requirements and will then lose the use of the library. When someone else has knowledge that is not shared with all, it does make those without knowledge vulnerable. How much of the book is factual? Was the rule of one book lost actually used to eliminate stops on the library's rounds? I’m going to answer these two together: the camel library actually exists and makes runs in the northeastern corner of Kenya near the border with Somalia. It started in 1996 with runs out of Garissa and with the rule that if any one person in a settlement didn’t turn in a book, it wouldn’t return. In part, this was an effort to get people used to the very idea of a library – this is a region where the illiteracy rate was said to be 85 percent, but I suspect was much higher, and many people had never held a book in their hands. Also, the camel library did not have enough books, so couldn’t afford to lose them. This very intense library fine carries the potential for dramatic tension, of course, and that’s what started, for me, the story of the novel. The camel library does NOT have this rule any more! Garissa and the bush are described as they really are; I visited the area and went out on some library runs. All the novel characters and the circumstances surrounding them are invented. So are the mosquito quotes. What impact has the camel bookmobile had on the lives of the people? I’m guessing this question applies to the real camel bookmobile? Mainly young people take advantage of the camel library, and for them, it is offering new possibilities to their lives. Before now, if you were a child of a pastoralist in this region, you knew that you would grow up to be a pastoralist. Now, the camel library is opening other doors by, first of all, showing people there are other possible ways to live a life, and secondly, giving them the possibility of becoming educated enough to take entrance exams for continuing school in Nairobi. On the other hand, some members of the older generation are sad to see the old ways fading, and they are worried about the corruption of the larger world – this is reflected in the novel as well. What did you learn from the village people of Kenya? When you visited Africa, did you feel like a zebra among giraffes? Ha, very nice! In fact, I’ve spent many years living overseas, and was in Afghanistan in 2004, and I usually start to feel comfortable very soon. Additionally, an old friend I’d known in Jerusalem has now settled in Nairobi, and he met me at the airport and provided a driver and too much advice! Besides, I found Garissa to be very wonderful and gentle-hearted. How did you make the transition to writing fiction from news reports? I spent five years reporting from the Middle East, based in Jerusalem, and then five years reporting on the collapse of the Soviet Union, based in Moscow. At some point during the latter, I began to dream fictional stories, and I eventually understood I was being shown a fork in the path, and I had to choose. With support of my husband, I quit journalism and began working on fiction. Do you have several projects going at one time or concentrate on just the fiction? I prefer one project, if at all possible. Right now, for instance, I’m finishing up revision on the next novel, and I’d like to concentrate solely on that. But I also teach novel-writing classes online and live, run a bed-and-breakfast and do sometimes find myself involved in non-fiction, reporting work. So balance is a key issue for me! What did you learn in writing the book? Of course, I learned more about the people of this region of Africa. I also enjoyed the chance to explore something I’ve thought about for a long time: the challenges and pitfalls of being an American overseas. We so often go abroad with such generosity of spirit, but also with the idea that we are bringing ... whatever it is. Money, technology, a better political system, or, in the case of The Camel Bookmobile, books. And in the process, we sometimes fail to honor, or even learn much about, old traditional cultures, that have as much to teach us as we do them. This is the lesson Fi ultimately has to learn. Question: How did you make the transition to writing fiction from news reports? Do you have several projects going at one time or concentrate on just the fiction? >>I don't think we have to decide if it is right or wrong. The community can decide to not allow the bookmobile, or families and individuals could decide not to participate. I certainly think it should not be forced upon them. The reading of the scents of animals and lay of the land, etc...is a great wisdom of its own. No, she's taking advantage of the distraction to be disloyal to her husband, who so wants to please her. They are nomadic, so travel from place to place like dust, lighting somewhere for a while only to move again when the pressures of water and food urge them on. He has a point...but should he not be interested in somehow preserving these oral stories? Well, it may be an ulterior motive, to not have to stop there any more, but the people do have to learn the value of a book, something that may not have much meaning for them if they don't read. I don't think it is such a bad rule unless they have some other way of paying back what they lose. I can see that words on a page would seem like nothing at all to someone who is not familiar with written language, but then to have someone come along and read it and give the characters meaning...and then another to come along and get the same meaning from those patterns might seem like some sort of magic or telepathy. Reading would seem like a great skill (it is!) that could be used unpredictably for good or bad. Book Buddies, please start posting your questions NOW. I will be sending our questions to Masha Hamilton late tonight and again on Friday. You'll be able to read her answers tomorrow night (Monday) and sometime next weekend (maybe Sunday or Monday). You were excited about having the author join us, but you have to do your share of the work by coming up with questions. How much of the book is factual? Was the rule of one book lost actually used to eliminate stops on the library's rounds? What did you learn while writing the book? Is there a question you would like to answer than we haven't thought to ask? How much of the book is factual? Was the rule of one book lost actually used to eliminate stops on the library's rounds? What impact has the camel bookmobile had on the lives of the people? Mr. Abasi's beliefs illustrate the assumption that it is best to stick with what is known and what is practical rather than venturing out to the unknown. Elim's belief turns the struggle between old and new into a religious/spiritual conflict--if something is different just label it a sin. Matani's belief seems to be the realistic one from the western perspective. At least he is a person from within the group who is trying to effect change rather than someone from the outside trying to make changes. Tsk! Tsk! Jwahir's discovery of something good about Library Day is hardly the builder of happy families. In a way though, maybe destroying one's family while bringing change may tie in with the concept of changes being made through book learning as opposed to traditional oral learning. I have gotten a healthy start in The Camel Bookmobile and find the trip fascinating. Even though I love to read and reading has enriched my life and taking books to those who would not otherwise have books initially sounds like a wonderful project, I wonder whether this like other endeavors which changes the cultures of others is the right thing to do. Although much less violent than our current taking of democracy to Iraq, it is a similar situation in which we presume that our way of life is better than that of other cultures. The other thing that disturbs me about the book is that some of the books taken to the people are so inappropriate to the people in Kenya. I realize that funds were scarce and they took what was given to them, but it bothers me that there wasn't stricter criteria for the books taken. Speaking of strict, the requirement that if one book is not returned the whole community loses camel bookmobile services also seems overly harsh. I feel like I am talking out of all sides of my mouth--I question the wisdom of taking the books to the people, about the quality criteria, and yet am concerned about the people losing this opportunity because of one person in the community not returning a book. I know that people have probably moved on to the next book, but last night People of the Book was one of the books reviewed on a national book club that is shown here on the ABC (our public network). I thought that some of you might be interested in watching the video. It runs for about 10 minutes, and was quite an interesting discussion. The main presenter is a journalist, and the other two regulars are Jason and Marieke. She is an actress/writer/blogger and Jason is the Books Editor in one of our major newspapers.The other two are guests - one is a satirist and the other an author. My copy of the book was delivered just before 1:00 pm today, just in time for us to start. Somebuddy has already asked when the schedule would be posted ... and I must admit that I am simply not a magician ... I cannot post a monthly schedule for a book I have never seen. Nope, I'm great and wonderful and all sorts of things, but I cannot produce outlines out of thin air. Today is the date of publication of the paperback version, and now I have a copy in hand. Therefore, I can (and have) outlined the book in the past 45 minutes, having turned . every . single . page . of this copy. Yes, you are welcome to see what I have discovered ... and outlined for my notes ... by clicking on my Notes, Quotes, and Questions. And now, we are off and running!